For Christmas 2016, we are offering our two most popular products together at a huge discount. We’re offering the combination on Black Friday for $60.00. If you miss this Black Friday offer, we’re having a second chance to get this at this low price again on Cyber Monday. So that’s two opportunities to get this combination – Black Friday, and Cyber Monday only. We’ll continue to offer this combination at a discount until Christmas but the $60 price is only good on these two days. 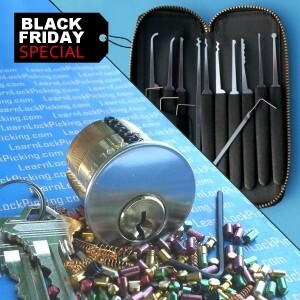 The “regular” discounted price will be the same as our 6 pin practice lock and will available until Christmas. Click Here to take advantage of this special offer.